The India Skills Report 2018 highlights trends in employment and the outlook of hiring landscape in India while understanding the needs of the job seeker and organizations. The fifth edition of the report was brought out by the Confederation of Indian Industry (CII) in collaboration with its partners – Wheebox, PeopleStrong, Pearson, Association of Indian Universities (AIU), United Nations Development Programme (UNDP) and All India Council for Technical Education (AICTE). This unique initiative aims to bridge the talent demand and supply in the country, by providing a clear understanding of the requirement of skilled manpower in the various industries. India is the youngest nation with more than 54% of its total population below 25 years of age and 62% in the working age group of 15-59 years. For building a pool of skilled and talented workforce, recent skill development initiatives undertaken by the Government include Skill India, amendment in the Apprentices Act, sector skill councils and others. The employment landscape is rapidly changing and new jobs are emerging with fast disruption in business models around the globe. Skills required today as well as job markets are markedly different from those 10 or even 5 years ago. The speed with which these changes are taking place is bound to accelerate. Therefore, the need of the hour is to build a skilling system which would enable the workforce to adapt and match the new requirements, a system that responds well to business needs and also provides new opportunities for all. The Skills Report 2018 highlights the current trends along with laying out what it will take for India to become the “Skill Capital” of the world. 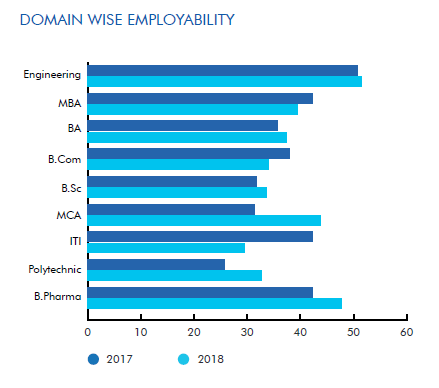 The Report is a blend of two distinct sections – (i) the Wheebox Employability Test, an employability skill test assessing students in the current context and (ii) India Hiring Intent Survey, a corporate job survey, which analyses industry responses to bring demand perspectives. WEST assessed the employability factor for students by looking at employability of the available pool of skilled people with the help of a structured online assessment tool. More than 5 lakh students from 5,200 institutions with varied educational backgrounds were approached for skill availability, covering 29 states and 7 Union Territories. Results of the survey revealed that this year’s employability score reached a new level of 45.60%, up by 5.16 % over last year’s score. The score indicates that around 45.6% of students are employable and are ready to take up jobs. A higher score is reflective of the efforts undertaken by various stakeholders, including the Government, to provide more employable resources to the economy. Survey results further revealed that Information Technology (IT) and Computer Science courses have the highest employability rate with 64.5% and 56% respectively. The survey found that Engineers were also highly employable at 52% and that MCA students’ employability was on the rise in 2017, registering a 13% increase from 2016. Bangalore, Chennai, Indore, Lucknow, and Mumbai were the top 5 cities with high employability. The data also reported that there has been a decline in female employability in 2017 compared to last year from 41% to 40%, while male employability increased significantly from 40% in 2016 to 47% in 2017. For the Hiring Intent Survey, more than 1,000 corporates from 15 different sectors were approached to assess skill requirements for next year’s hiring intent. The analysed data based on responses from organizations gives insights on current as well as hiring trends for the next year, preferred sources of hiring, experience and education specific hiring requirements, apprenticeship awareness among organizations and opportunities to students for the same. Results revealed that hiring intent for the year 2018 is positive with a 10-15% increase in hiring intent compared to last year. A primary research conducted on more than 120 employers revealed that 49% employers are positive on hiring. Banking, Financial Services, BPO, KPO, ITES, Insurance and Retail sectors are projected to witness a strong rebound in hiring numbers as compared to 2017. The Survey also throws light on important parameters such as hiring intent of companies based on type, size, and sector as well as work experience. 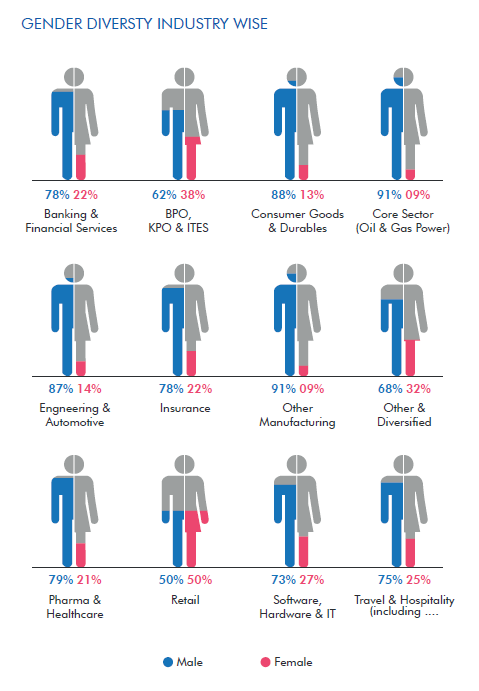 The survey also helps understand gender diversity and gender gaps across sectors. According to the findings, the Retail Industry has the highest female workforce with 50% female participation while sectors such as organised manufacturing need to push for women employability as currently female participation is only 9%. The survey also focuses on future skill requirements and the impact of automation. 69% of the respondents agreed that automation is affecting their industries. Key future skill sets that employers would be looking for hiring were in the areas of Data Analytics, Research & Development, Artificial Intelligence, Concept Design and Robotics. With a view to providing students a platform to assess the current state of skill requirement from the employer side and also helping the employer assess skill availability through employability data, the report provides information on four domains – education, gender, geography and internship in the ‘Matchmaking’ section. This was carried out with the objective of matching the demand and supply side for employers and students to find their equilibrium point. The results would be useful for both organizations and students to understand the skill gap in these domains.